Ayush Tandon (born 31 July 1998) is a film actor working in Bollywood and Hollywood films. He played Pi, age 11 in the 2012 Hollywood film Life of Pi. He made his acting debut in the 2011 Bollywood film 7 Khoon Maaf  At the age of 10 he, along with Vasundhara Raturi entered as contestants in the first season of Chota Packet Bada Dhamaka and were declared as the winning jodi (team) during the grand finale which took place on place on 3 January 2009. Ayush was born in Mumbai to parents Hatinder Tandon and Asha Tandon. He cleared his Secondary School Certificate (SSC) board exams in the year 2014, scoring 87 percent and is currently a student at Annasaheb Vartak College of Arts, Commerce and Science. 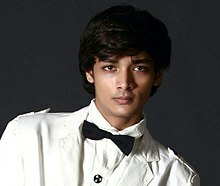 ^ "'Life of Pi' child actor Ayush Tandon fulfils his father's dream". Indian Express. 17 November 2012. Retrieved 2015-05-04. ^ "Little Star". India Today. 24 November 2012. Retrieved 2015-05-05. ^ "3-minute short film "She" released on YouTube, very unique perspective on eve-teasing". The Indian Wire. 25 November 2018. Retrieved 2018-12-04. ^ "शॉर्ट फिल्म / घूरती नजरें और जबरन छूने की कोशिश से जूझती हर लड़की, 3 मिनट के वीडियो में दिखाया सच". Dainik Bhaskar. 26 November 2018. Retrieved 2018-12-04. ^ "'Life of Pi' child actor Ayush Tandon scores 87 per cent in SSC". Mid Day. 19 June 2014. Retrieved 2015-05-05.